October | 2012 | eating with S.O.L.E. “All time best ever spaghetti squash” claims my daughter, who is a hard sell at the best of time on the spaghetti squash, in fact when we pulled in a record harvest of ‘oh I don’t know maybe 45 of these babies, she was groaning in agony at the idea of having to eat that many of them! 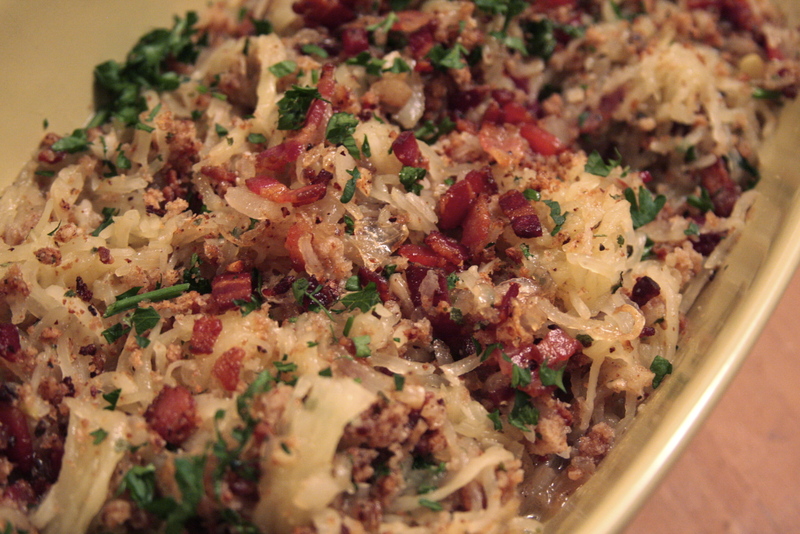 That was until I baked some with olive oil and garlic then tossed them with toasted garlic cheesy bread crumbs and a good kick of bacon and fried onion. 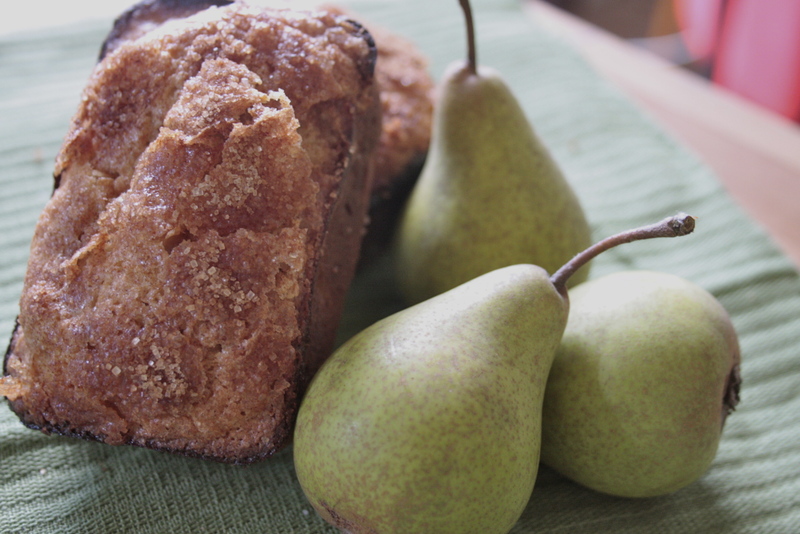 She was in squash heaven, and I am under strict order to make this again. It’s all so very simple, so there is no reason not to make this! Start by halving a large spaghetti squash (lengthwise) drizzle with olive oil and a few cloves of minced garlic, season with S+P and roast at 400 for about 35 minutes. Until fork tender. In a small cast iron pan brown up tiny ribbons of about 6 strips of bacon, along with a small yellow onion finely sliced. In a separate small pan toast about 1.5 cups of bread crumbs, when they become fragrant and start to brown add 1/2 cup of parmesan cheese. roasted squash, gently forked out of the skin, maintaining the long spaghetti like strings. season with S+P as needed, and enjoy! A handmade gnocchi is like a hug from your italian grandmother (which I don’t have) but I would imagine her being round and soft and sweet, just like these pillows of heaven. I was given some squash from a friend, not sure the type but the flesh was deep and dark and orange, and I decided to roast it up and mash it up with equal parts of ricotta cheese, then once turned into dough cut into tiny mouthfuls and simmered in brown butter with a garlic and sage infusion finished with a glug of white wine and sprinkle of a robust cheese. ‘Um heaven indeed. These start off mostly healthy, and certainly you could boil them and toss them with a drizzle of your favorite pasta sauce, but if you really want to enjoy these in all their gnocchi goodness then go for the brown butter fry! * HALF of this dough recipe will make dinner for 4, the balance can be frozen, or used up within a couple days. 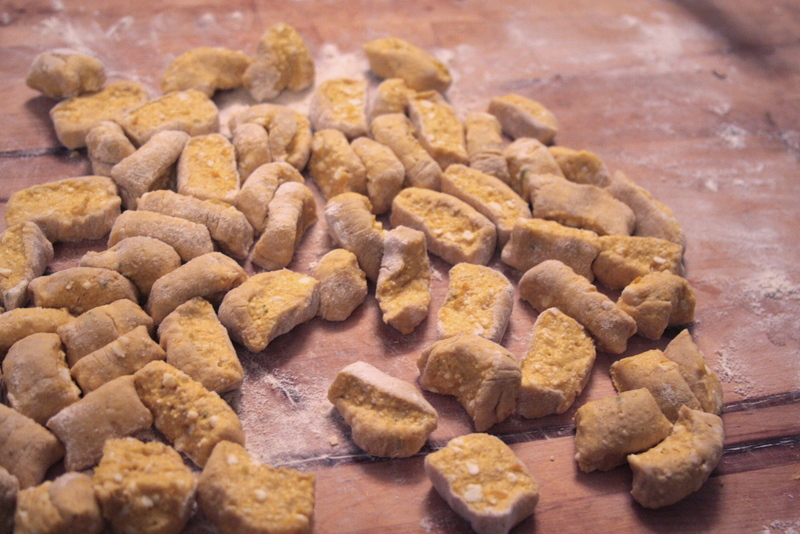 The to form the gnocchi’s you can use any number of techniques, there is many a web page dedicated to how to form the perfect gnocchi. I opted to roll out the dough from little balls into long snakes (on a well floured surface) then cut the snake into little 1cm thick “ovals” which you can then roll down the back of a fork or off a butter paddle… or if you rushing of to a knitting night with the gals, just chop and plop them into a pan filled with bubbling brown butter. Pan fry each side for about 3 minutes until golden brown then toss browned gnocchi in a large bowl. Once all of them are cooked and waiting patiently in the bowl you can add 1 large minced garlic glove into a pan and brown, add a pad of butter and a splash of white wine (about 1/2 cup) simmer quickly and add a handful of fresh herbs (sage, rosemary and parsley were my herbs at hand) pour the “sauce” over the gnocchi along with a handful of freshly grated grana or parmesan and gently toss until well coated. 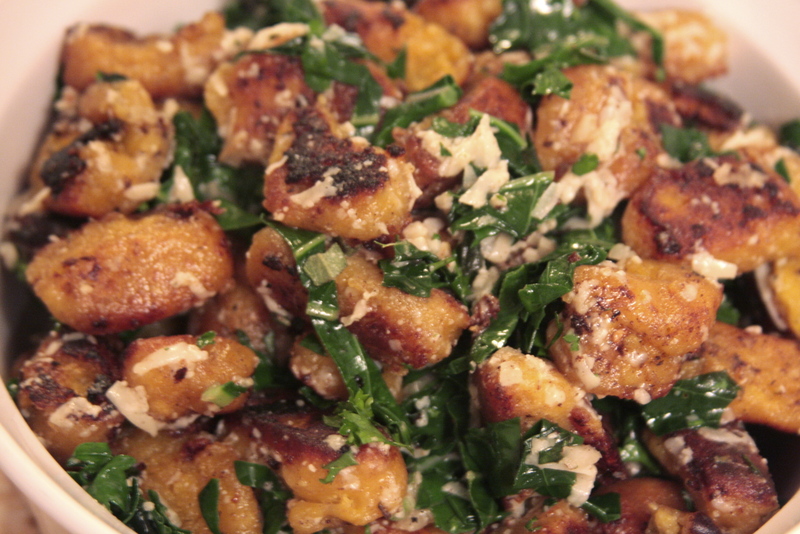 I threw a handful of fresh ribbons of kale in with the garlic too which was a nice addition. Anyway your coat or cook these they are hug-i-lishious fabulous. 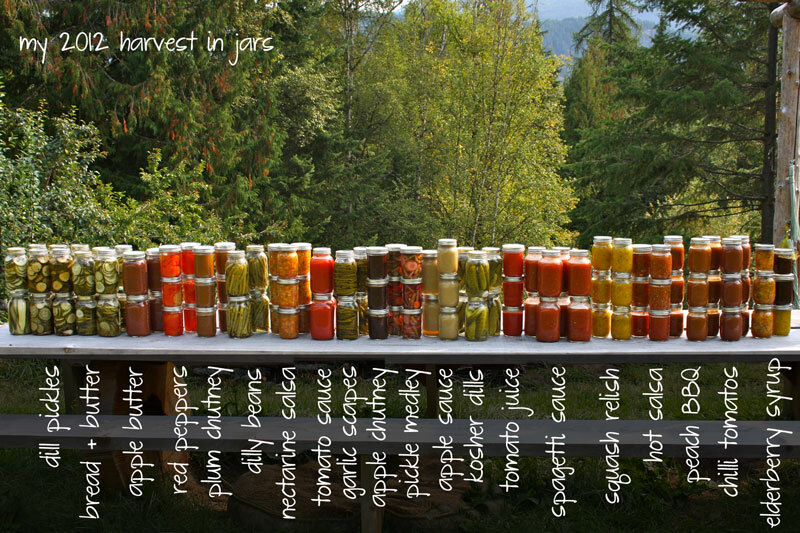 I have been swamped these days not only with canning, but with putting on a celebration of putting up! 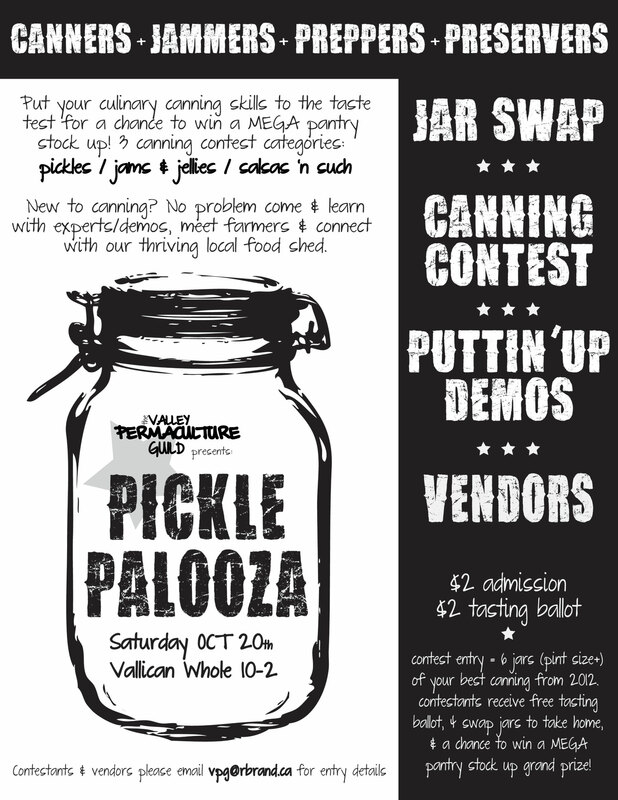 After a few years of wishing I would find time to organize a canning swap, I decided to just jump in and organize the Kootenay’s 1st Annual PICKLE PALOOZA: A Canning + Jamming+ Preserving + Prepping Festival of Local Harvest! 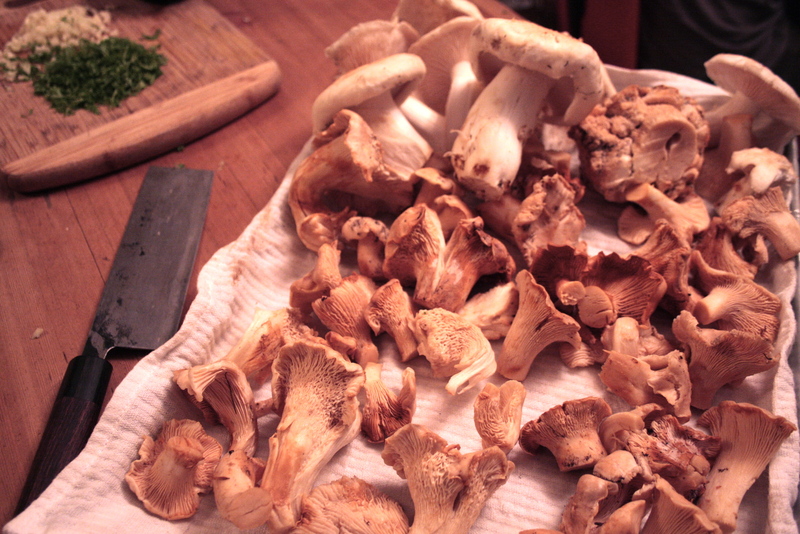 One of my favorite things about fall is mushroom hunting! This is my third year foraging for fungi and I just can’t get enough of this edible past time. My daughter and I took the fall mushroom class again this year, and finally I think some of this crazy mycelium is sticking in my mind! Me and the Chanterelles were on the same wave length, I could truly sense where they were, and found myself lifting bits of forest duff only to find a lovely chanterelle ready to burst out! What luck. Last night we enjoyed a creamy chanterelle fettucini and last year I made this killer cream of chanterelle soup. But my favorite mushroom of the day was the pine mushroom (Matsutake) . I am hopeless at finding them, but my daughter and her friend (with the help of our guide and local mushroom enthusiast) found a few sweet flushes. We left with a basketful and shared many with our friends and hunting companions. 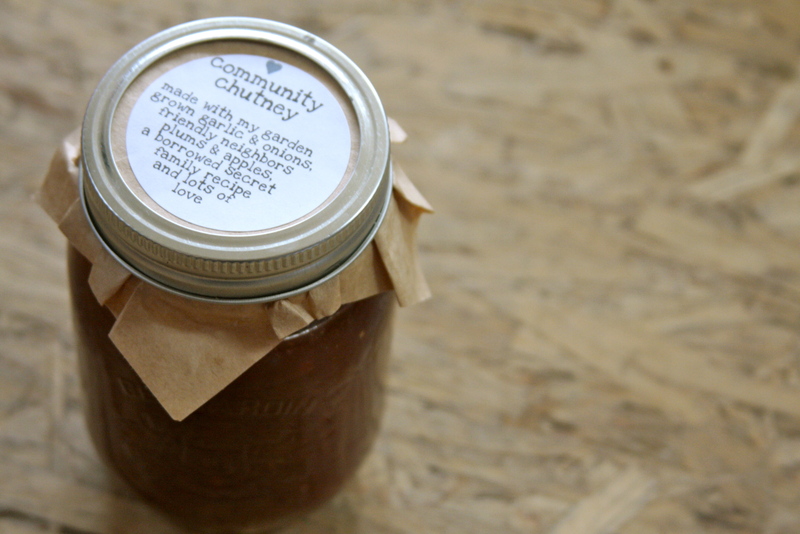 Burwell Store recipe swap time again! 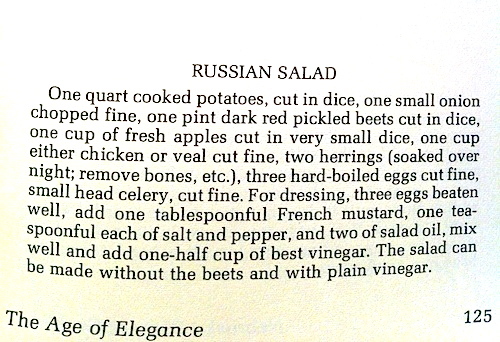 This months vintage ditty is a Russian salad, that actually didn’t sound too scary for a change! One main ingredient in the salad is pickled beets, so I thought I would step this swap back and do a DIY pickled beet recipe. It has been a crazy busy tough start to this month and I had a massive basket of freshly pulled assorted heirloom beets to deal with before hitting the road, so I zoned into my kitchen canning meditation and got my beet on! 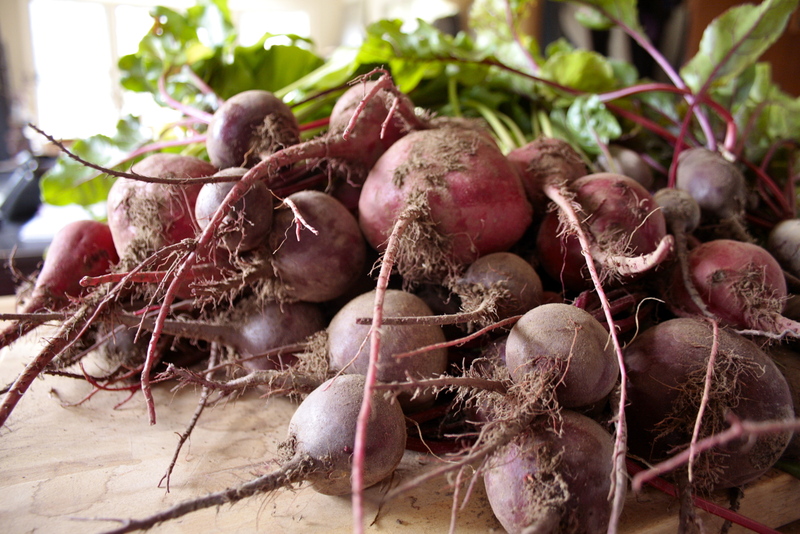 These beets are sweet and tart with a gentle hint of cinnamon and a kick of ginger root. 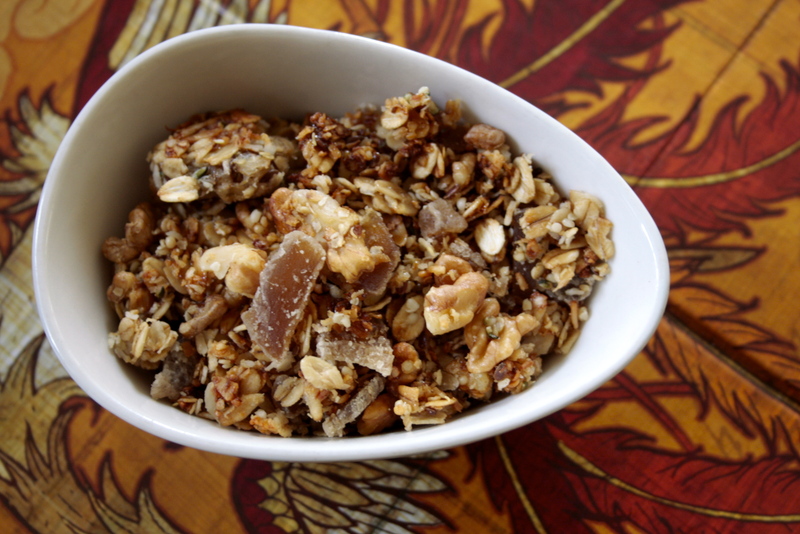 Made with apple cider vinegar and cane sugar, these seem to please most folks and make for lovely salad additions in the midst of cold winters, or a simple jar full of snack food to be attacked by the forkful! If someone gives you a jar of pickled beets, they must really like you! Seriously the process is messy and has way more steps than lots of other pickled things do, so be grateful for any you receive! As with any canning project, it’s all about multi tasking and having many pots on the boil at a time. 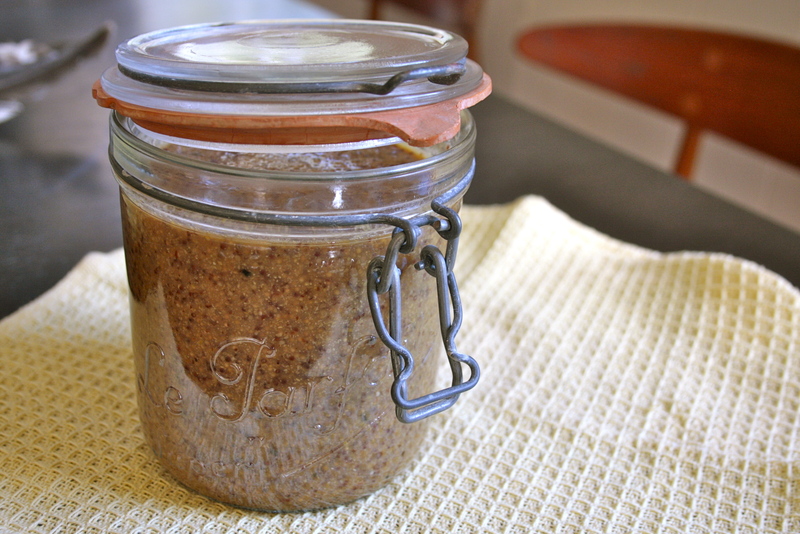 You need to start by sterilizing your jars and keeping them warm (either in a hot water bath or in the oven), while warming your canning lids and also getting your sweet brine up to a gentle boil. The key to successful canning, is keeping everything super spanky clean, sterile and smoking hot! You’ll need about 6 lbs of beets and this recipe yields 8 pints. Bring to a gentle boil stirring until the sugar is dissolved. 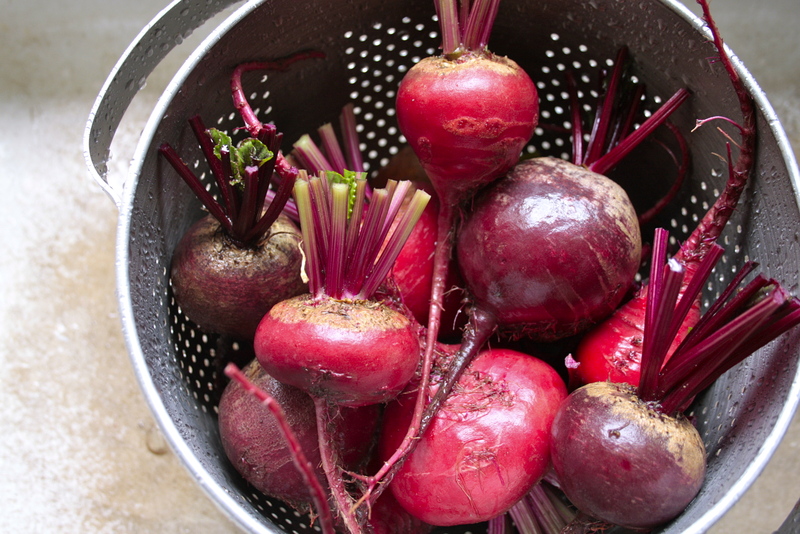 Once all your pots are boiling away you need to wash and trim the tops of the beets leaving behind about 1″ of stock and all of the tail. Boil the beets for about 25 minutes (depending on size, you want a fork to easily pierce the beet but still be ever so slightly firm in the middle. Remove beet from boiling water and soak in cold water, then using your finger and the edge of a spoon remove the skin, root and the base of the stock. 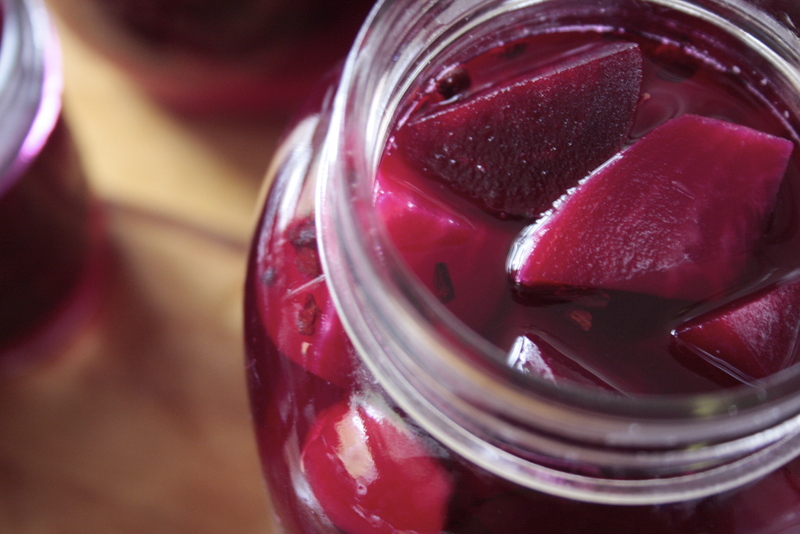 Quarter or eighth your beets into similar sized bites (or slice them all into 1/4″ rounds) and fill your hot and sterilized jars up to the neck with beet pieces. 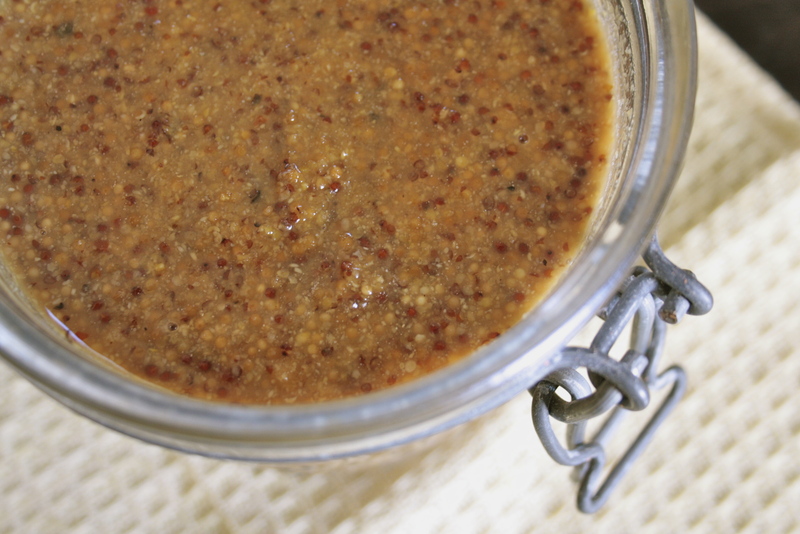 Add 1-2 slices of fresh ginger root (peeled) into each jar and a small piece of cinnamon stick or some nibs. Top each jar to 1/2″ head space with boiling brine. Wipe jar top clean and place hot lid on jar, then screw ring to finger tight and water bath process in rapidly boiling water for 15 minutes (for pint jars). Ensuring the water covers your jar lids by at least 2″. After 12 hours or so, ensure all of the lids are sealed tight, any that are not can be stored in the fridge for a few weeks, or could be re-processed. Allow the beets to settle into their new flavor bath for a few weeks before enjoying, or cracking open to make a russian salad if your say flush in herring, or best yet give as holiday gifts to people you really love!